I have Marie Antoinette too but still haven't read it. I plan to join this too and am putting together my list of possibles. I think most of mine will be Japan related this year. I still haven't decided whether to join this challenge (another one!) or not. I have been reading and plan to read quite a lot of non-fic this year, so it would not an entirely unrealistic goal. Hooray, Hooray! 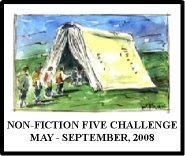 Glad to see you have joined us for the Non-Fiction Five Challenge! Now that I think about it, there is another "version" of Love & Logic that isn't as tough, but I can't remember the name of it.